It says a lot about a developer when even though there are just two titles to their name, both released to critical acclaim and both are better than almost every other game released in their debut year. Limbo, their first title, instantly became one of, if not, my number one game of 2010, I absolutely fell in love with it. When I then heard that Playdead was then working on a spiritual sequel, of course, I was instantly excited. It took me a while to get round to playing Inside (we can pretend I was just waiting on a Switch version…), but now I have experienced it in full, what I can say is that while it didn’t quite strike a chord with me as much as Limbo did, it is still one hell of an experience. For those that have played Limbo, you will find that Inside shares many of the same elements, such as it being a platformer puzzler, an almost identical control scheme, and some similar themes throughout. There isn’t much in the way of a story to be told when you first fire up the game too, but it urges you to find one lurking around in there as you progress. You play as a nameless young boy and you’re not really sure what your aim is, to begin with, other than to survive through a series of deadly traps. Again, very similar. Gameplay is simple, but that’s only to its benefit. You can move left or right, jump or grab objects, and that’s your lot. In Limbo, you could not interact with anything in the background, whereas here, background elements constantly have a bearing on puzzles you will encounter. For example, early on you’re chased by a pack of wild dogs that come from the distant background, now this couldn’t have happened in Limbo as that was all on one level. 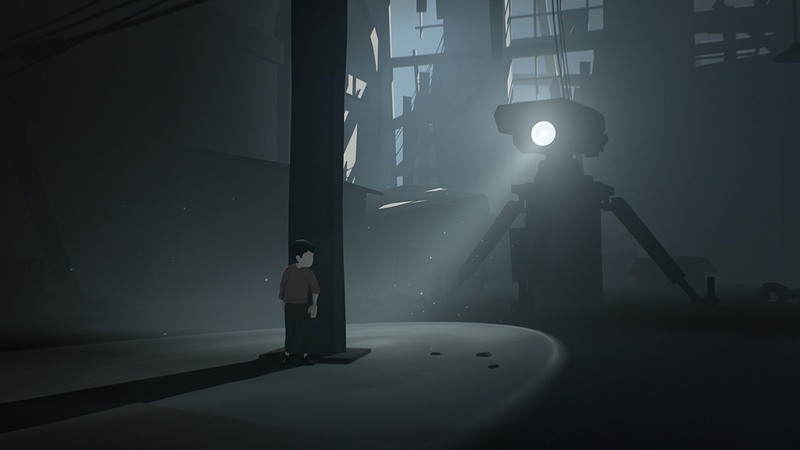 It just adds a bit more depth and detail to not just the puzzle variety, but to the world of Inside in general. Some of the puzzles are wonderfully genius and mindboggling at times. Just as all good puzzle games do, there will be moments where you feel like you have tried every conceivable solution, only to then have a eureka moment five minutes later. Considering the limited actions the player can do, it is striking just how many different variations of puzzles have been packed into the game, and how complex some can be. I never felt that the puzzles were unfair either, which is yet another impressive feat. I never looked at any guides because I got stuck for ages and ages. I also never thought that the solution to a puzzle was excessively difficult in the grand scheme of things because this isn’t like other games, there is a logic to everything you do. I know that one of the complaints of Limbo was that at times it might have relied too heavily on puzzles at certain points in the game. I for one never saw that as a problem in that game and I certainly don’t see it as a problem here either, as I see why the need for slightly more puzzles at certain times during the playthrough is necessary. One bad argument about some puzzles is that you will instantly beat a few the second time through, as they can be purely trial and error, which I am never too big of a fan of, as they don’t really require too much in the way of skill or ability. One thing that Inside does tremendously well is its ability to ramp up the tension. The muted colours and the soundtrack, or lack thereof, works wonders in this regard, it allows you to feel isolated in a world that is unwelcoming and depressing. It gets dark, and I’m not just talking about the lighting here. Darker and more disturbing than Limbo in that sense. Some of the things you see throughout the course of your playthrough will disturb you and add fuel to your nightmares. Underwater sections also add to that, especially coming from somebody who is rather terrified of water sections in some video games (the shark in Banjo-Kazooie instantly springs to mind, and no I’m not joking),. It adds on yet another disturbing arrow to its bow. Playdead make you sometimes feel helpless in certain sections of the game, but the underwater sections for me are so much worse, I really felt for the poor little boy who I had killed countless times in there. There are only a couple of things that stop Inside from being truly incredible. Firstly, it’s a short game, my run from start to finish came up at around three or so hours and that is me going in completely blind, trying to explore all I could. Because of the type of game it is, there is little to no replay value for the vast majority of gamers out there. There are secret orbs scattered around for you to find, which unlocks a secret ending if you manage to find them all. Even then, I can’t imagine many will be rushing to get back into right away. Secondly, it seems to be the kind of experience, as Limbo was for me, where I would go back to it a number of years later in order for your mind to forget the answer to many of the puzzles. As once you know the answer to the puzzle, most of the fun is taken away. If you loved Limbo then do not hesitate, just grab your Switch and buy Inside. For such a simple game, it is remarkable how much variation there is. Puzzles are expertly thought-out, the atmosphere is top-notch and its crammed full of memorable moments. It’s a stunning but desolate adventure that I urge you to try out. Even though it’s a short experience, it makes you consider what you have just gone through long after completion. It is one of the standout games in the Switch’s ever-growing library.